One of the problems caused by the inability to understand how it is necessary to think in a rapidly changing market phase, is the misunderstanding about the goodness of strategies that aim to offer extremely low prices. 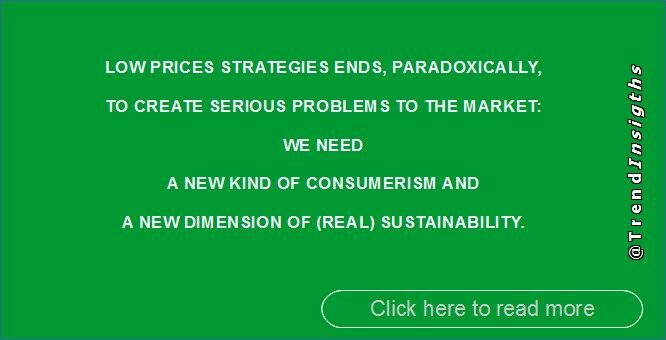 The question is that if it is true that Consumers are looking for a low price due to the recession, it is also true that this search for capacity to offer very low prices produces many negative side effects in a market that needs a new dimension of (real) sustainability: either for the Producers (ie allowing them, at least, to survive) and for the Users (a dimension which is based on an actually useful value that justifies the value of the Useful Value°). (the low price can still be a competitive advantage, but it is necessary to focus on the development of quality that make the products more sustainable, with an improvement of the characteristics such as: durability°, or the new Product as a Service° concept, the service that can be provided by the new generation of Smart products). (the product in this case has a life much higher than that of current generation products). ● THE LOW PRICES THAT CAN OFFER THE E-COMMERCE AND THE HYPERMARKETS ENDS, PARADOXICALLY, TO CREATE SERIOUS PROBLEMS TO THE MARKET. The fact is that if it is true that a lower price attracts the Consumer, this strategy can only work temporarily, until the truly disruptive products arrive on the market. In other words, with such strategies it is possible to induce the Customer to buy the product only because they do not find products of better quality (able to really satisfy the needs of the New Demand°). And therefore, among low quality products, they obviously choose those with a lower price. – they create a problem for themselves, because in this way they leave ample room for competition that is beginning to develop truly innovative (disruptive) strategies. – they create a problem for the market in general, since they end up eliminating those characteristics of the market that can allow one of the forms of business required by the new Demand to be developed, that of the Local Business°. The fact is that new Demand requires qualities (of the product and of distribution) that can not be obtained with the current e-commerce model (it is obsolete compared to the need for disruptive leap° required by the new Demand). What is required is a disruption of the development of sales strategies in which the Local Commerce are recovered those Values based on the direct relationship of the Customer with the shopkeeper and with the product (obviously, a radically innovative sales method thanks to ICT and IoT).